When you love your pet you want to surround her with stuff you love. If she could pick her own functional and decorative tableware, I'd bet she'd go for these pet food bowls and place mats. For example, there's the Bella Bowl. I bought my first Bella Bowl a few years ago when I spotted them in a local PetSmart. 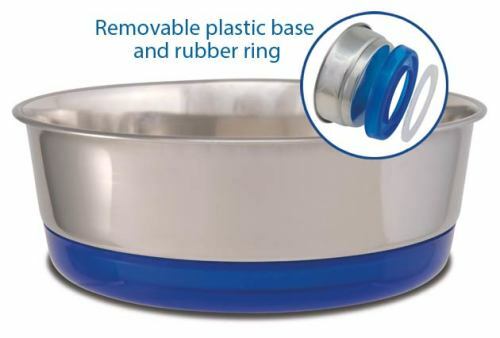 Although ceramic cat bowls look nice, the Bella Bowls are stainless steel, which is a solid choice when it comes to keeping bacteria to a minimum. Even after a bowl is carefully, thoroughly washed, there is still remaining bacteria on our own tableware, and that is no less true for pet food bowls, but stainless steel has been found to wash cleaner than other dish materials, so it's sanitary choice for pet bowls. And the bowls are unbreakable; they last forever! Bella Bowls come in different sizes for cats and dogs, and they have many cute designs (e.g., valentine hearts, argyle, dragonflies, etc.) on the outside of the bowls. The small size is one you may want to consider for your kitten, puppy, or small cat or dog (under 10 pounds). It just fits in the palm of your hand and holds about a pint of food. Diameter is 4.5 inches. And you don't have to worry about the Bella Bowls sliding around the floor or table; they have rubberized skid-proof bottoms that are removable to make the Bowls totally dishwasher safe. Here's another great product from Loving Pets: the Bella Spill-Proof Fish-Shaped Mat. 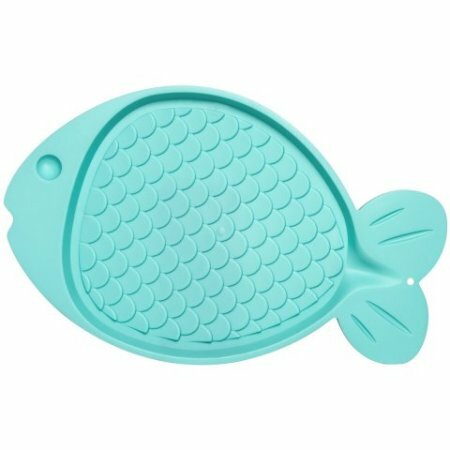 Made of sturdy rubber, the fish-shaped mat helps makes your Bella Bowls even more stable, and it keeps food from messing up a raised feeding area or floor. 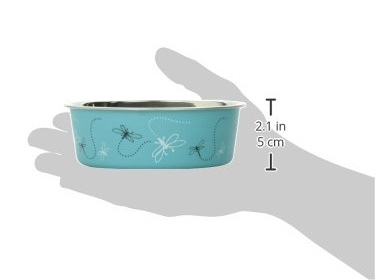 About 19 x 12 inches, the mat comes in turquoise and beige and holds two medium size Bella Bowls or three small bowls. My 16-pound cat needs 5.5 inch bowls, so I keep his water and his dry food on the mat, which are available to him all day. Here is my cat's dinner spot. Part of the new Milano Dolce collection, Loving Pets has made an even sturdier individual pet bowl made with a totally removable rubber bottom and pet dish rim. 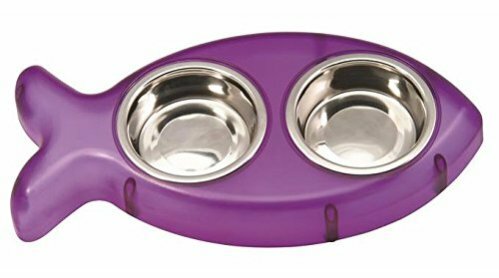 Available with a blue or pink bottom, the Dolce Dinner Bowls have an inner diameter of 5.5 inches, so they're very appropriate for cats and small dogs. You will need to remove the rubber rim from the bottom of the bowl before putting the Dulce in the dishwasher, so the heat doesn't destroy the rubber. But I also remove the rim before hand-washing the bowl, as water gets between the bowl and the rubber making it difficult for either to completely dry. 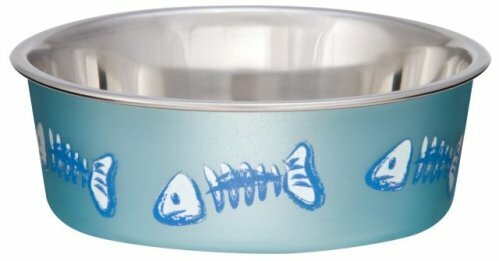 The Pesce Dinner Bowl is a great starter kit for a kitten or puppy owner. 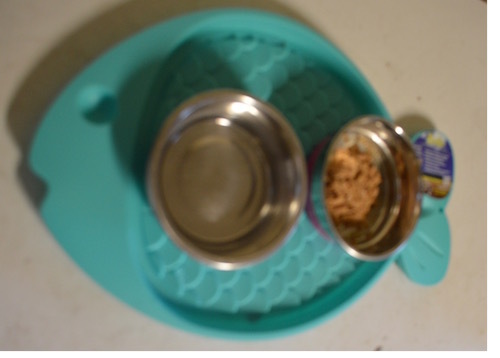 A space saver, only 15 x 7.5 inches, the set provides bowls for both water and food. Although the plastic fish-shaped mold does not have a rubberized bottom, it is weighty enough to keep a small dog or cat from moving it around. The 4.5 inch diameter bowls fit nicely into their holder, and again, they are dishwasher safe. The fish mold can be washed thoroughly by hand. The Pesce Dinner Bowl makes a great gift for a cat or small dog on your holiday list. These Loving Pet cat bowls and mats have my complete endorsement and my cat's! We use them!